The glorious apple harvest is coming in. Apples of many colors, sizes, and shapes are appearing at farmers markets and roadside stands. My question is always, “Is this a cooking apple or one to be eaten fresh?” Not every vendor has an answer. In some cases they are not even certain of the name of the apple. Here is a quick way to determine the cook-ability. Peel, core, and slice one apple. Heat a small heavy skillet. Melt a tablespoon of butter and toss in the apples. Let the apples cook on one side for about five minutes and then turn them over. Sprinkle on a little sugar just for fun. You will enjoy the apple tasting more with the sugar. Cook another five minutes or so until the apple slices are soft all the way through. A good cooking apple with still have its shape. A non-cooker will be turning into applesauce. The flavor may be fine with the non-cooker, but the form is not suitable for an apple pie unless you like applesauce pie. 2 Comments on "Is It A Cooking Apple? (Quick Tip)"
That sure is an easy way to find out. There have been so many times when I was told that the apples are ‘just perfect’ for cooking, only to be disappointed later. Many a times, I ruined my dish because of this misjudgement. Thanks a ton for sharing this. Very useful. Oh, that sounds delicious. 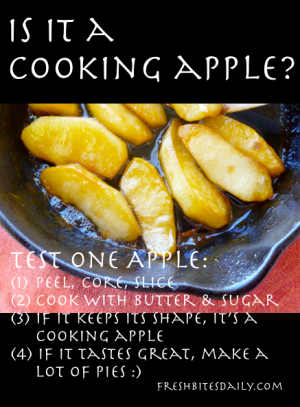 cooking apple is great. I would love to try this at home. Thanks for sharing the recipe.